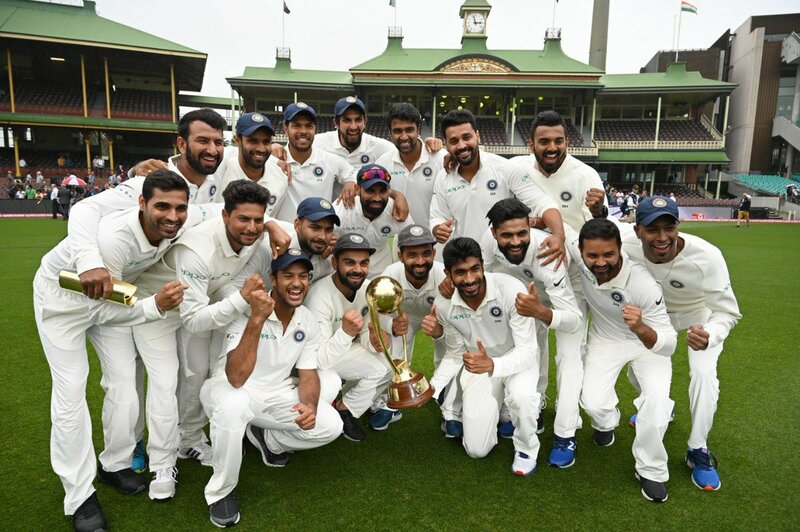 India created history winning their first ever series on Australian soil beating the home team 2-1 after the fourth and final Test ended in a tame draw due to inclement weather. India scored 622 for 7 in their first innings and then bowled out Australia for 300 thereby enforcing the follow-on. However persistent drizzle washed out day five thereby keeping the victory margin down to 2-1. Virat Kohli led the country to a maiden series victory on Australian soil, ending a 71-year wait to script a golden chapter in the game’s history. Australia was still trailing by 316 runs when the match was called off, ending India’s 71-year wait after wins in Adelaide and Melbourne. It is the first time India managed the feat since they began touring Australia in 1947-48. Consequently, Virat Kohli became the first Indian as well as the first Asian captain to win a Test series in Australia. India reinforced their status as the world’s number one test team and retained the Border-Gavaskar Trophy with the series win. After the match, Virat Kohli told Media “I’ve never been more proud of being part of a team, than this one right here.” He said “The boys make the captain look good. By far, this is my biggest achievement. It’s at the top of the pile.” Cheteshwar Pujara was declared man of the match as well as man-of-the-series. Australian batting was severely handicapped due to the suspensions of their premier batsmen Steve Smith and David Warner it can take nothing away from the heady achievement of Kohli’s men, who have conquered an unchartered frontier with a lion-hearted display. President Ram Nath Kovind today congratulated the Indian cricket team for their victory in Australia. In a tweet Mr Kovind said, gritty batting, marvelous fast bowling and a fine team effort has done us proud. Let’s make a habit of it! Prime Minister Narendra Modi today congratulated the Indian cricket team for their series victory in Australia. In a tweet, Mr Modi said it was a historic cricketing achievement and the series witnessed some memorable performances and solid team work. He conveyed his best wishes for the various matches ahead.